If there is one thing you should know about Canucks general manager Jim Benning, is that he likes to make hockey trades. He takes small risks to improve his team in the long run, and none of those risks include acquiring rentals. Most of his risks have come at the expense of draft picks. If you look at his track record, he doesn’t mind giving up draft picks. Benning: I don't like giving up draft picks, but Baertschi is going to be a top six player one day. Benning has professed his love for acquiring draft picks, and tells the media that he doesn’t like to give them up. However his track record over his first year of service in the organization contradicts that notion. These picks were expendable for Benning, since he already had picks for the second and third rounds of the draft anyways. The second-round pick, which was traded for Linden Vey, was originally from Tampa Bay in the Jason Garrison deal. The Canucks traded away their original third-round selection for Derek Dorsett, but acquired another pick in that round from Anaheim in the Ryan Kesler deal. With a plethora of selections in the 2014 draft, Benning could afford to deal a couple of his picks way. The ones he did trade away were for roster players who have currently spent the whole season with the Canucks. Since the beginning of this season, Benning has continued to show that he is unafraid to give up draft picks. The Canucks also don’t have a third round pick in the 2015 draft. They traded that away in the Kesler deal. Barring any further deals around the end of June, the Canucks will likely only have one draft pick in top 100 spots during the upcoming draft. They have held onto their first round selection, but as of now they won’t have another pick until the fourth round. While Benning loves his draft picks, he loves making hockey trades even more. Benning has traded away half a dozen draft picks over the past year, but every trade he has made is a calculated risk. These are all hockey trades, and he has only traded away draft picks for players that are younger. Many of his trades have been for players who will help this team in the future more than they will in the present. “We’re acquiring players that fit a profile that we like in terms of the way we play. From that 20-year-old to 26-year-old hockey player to set the foundation for our group going forward,” said Benning in his press conference following the trade deadline. Acquiring rentals is not something that is part of Benning’s mandate. No one can wave a magic wand, look into a crystal ball to tell which players will be successful NHL players down the road. Benning, and other talent evaluators alike, are bound to make some mistakes because it’s just human nature. Michael Hutchinson (3rd round, 2008). Even though he has traded away draft picks, many of those trades were for players who are just a little bit further along in their development, Of all the trades mentioned above, the oldest player he acquired was 27-year-old Derek Dorsett. Many of the players he received are only in their early twenties. Some players, such as Vey and Clendening, are getting their chance with the big club right now. 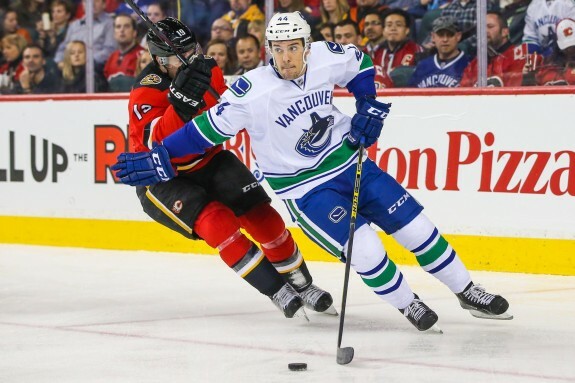 Others, such as Baertschi and Pedan, will continue their development in the minors. With these trades, Benning is trying to change the culture of the team. He is restocking the prospect cupboard that was one of the worst in the league a couple of seasons ago. With all of the players he is bringing in, he wants them to continue their development in a winning environment. Benning wants to establish that winning environment both in Vancouver and down in Utica. “We’re going to bring new players, young players into our lineup every year, but we want them to develop in a winning environment,” said Benning.